But what if the best set of kids dinnerware wasn’t even expensive? What if sometimes it only needed to look kiddish and a little bit silly yet very durable? Well, you see, when we have kids, we often design mealtime to be a fun time. Wait, can you remember that silly “cat and rat” story we often hear/tell around the dinner table? What about the funny memories (sometimes false) that we parents tell just to make the dinner lively? … That’s what I am talking about. A typical parent would often strive to spice their kid’s dinner with something nice and catchy to make the meals appetizing and enjoyable for the kids. Sometimes, upgrading your kitchen to accommodate new kids melamine plates, bowls, and other kids tableware could be one of the best ways to achieve the goal of making a kid’s dinner more enjoyable. In this fascinating edition, we will explore a number of available options that one can opt for when purchasing children’s dinnerware. Now, just as had been explored before, we are looking for a story to tell our kids at dinner time. That is why an ideal kids’ bamboo tableware dinner set has got to tell a story from the cutlery design. This “story” can be some giraffe drawings, some kid cartoons or even awesomely crafted alphabet letters. This is because kids are often keen on fine details on the crockery. So, if your kid loves cartoons, it could be great to have his/her plates and bowls reflect a little spicing of Tom & Jerry, King Julian or just any shiny cartoon that fits his/her favorite story. When kids become old enough to learn, it could be great to subtly change the story and introduce a spicing of classwork during mealtime. Honestly, which better way could we achieve that if we could not engrave a few alphabets artistically onto his/her favorite bowl or cup? You see? That is why you might opt to get a new set of melamine dinner sets for your kid that is punctuated with a few numbers and alphabets. It may look silly to a grown up, but junior will definitely love it. You’ve got to try it to believe it. Lastly, melamine utensils have built a reputation for durability over the years. Nobody loves the task of having to replace broken tableware over and over again. But with the playful nature of kids, accidents could sometimes be inevitable. So, instead of working on ways to stop the playful nature, you could as well think of ways to live with it by adopting a more durable dinner set. Here is where melamine and bamboo crockery loom out large. Most melamine dishes and bowls are light enough to be carried by kids and are durable enough to sustain accidents(as most kids do). 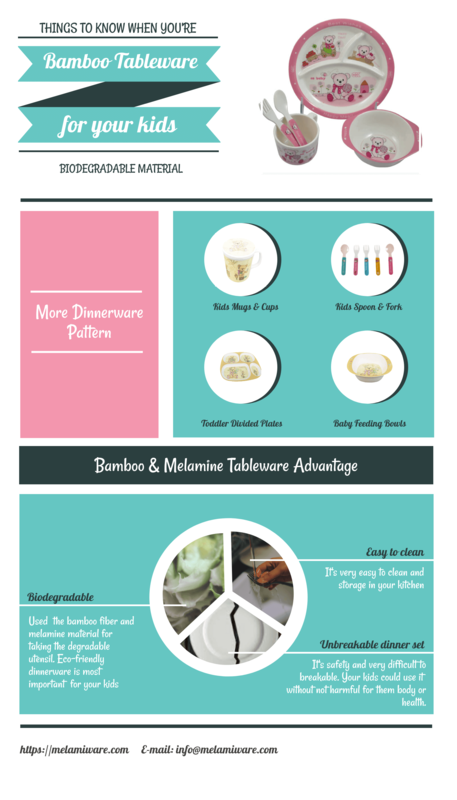 My personal favorites are the awesome bamboo fiber bowls for kids and the melamine divided plates for toddlers that are often adorable and kid-friendly. Melamine isn’t just durable, it is also affordable and full of kid spicing. Perhaps, this is the main reason you might opt to get one soon. When I first got married many years ago, we were given a set of melamine dishes as a wedding present. I had never heard of them before, but they quickly became my favorite dish set because of how light they were and how long they lasted. Now that we have grandchildren, I’ve been looking for another set of dishes that will work for them. I’m so happy that I found your site, and I love all of the designs on the kid’s dinner sets! Thanks for your kindly comment and share! Hope that you enjoyed the nice and happy time with your family. Eco-friendly and safety dinnerware, tableware is very important for our lifes.